When manufacturing a product, you can easily trace certain costs to individual products that you make. Call these expenses direct costs. On the other hand, certain costs don’t easily trace to an individual product; these costs are called indirect costs. For example, consider a good-old-fashioned paper book. To make it, the publisher needs a certain amount of paper and ink, some glue for the binding, and an employee to put the physical book together. These items are all direct costs. On the other hand, the publisher needs to pay a royalty advance to the author, not to mention salaries to the myriad editors who pore over the manuscript. And don’t forget about overhead costs (electricity, telephone, and so on) so that the editors can work in well-lit, air-conditioned offices. These overhead costs are just as important to the finished product as the costs of making the physical book. If the publisher decides not to pay them, the book won’t exist. However, trying to figure out exactly how much money in royalties, editor salaries, electricity, and telephone costs went into your single book is an impossible task, so you can’t pinpoint them as direct costs. Direct costs fall into two categories: direct materials and direct labor. Direct materials are raw materials that you can directly trace to the manufactured product. To compute the cost of direct materials for any product, just add up the cost of all the individual components or ingredients needed to make the product. Doing so requires understanding how your products are made and exactly what goes into each product. A single cup of sugar costs $0.50. Flour costs $1 a cup and cocoa powder costs $3 a cup. 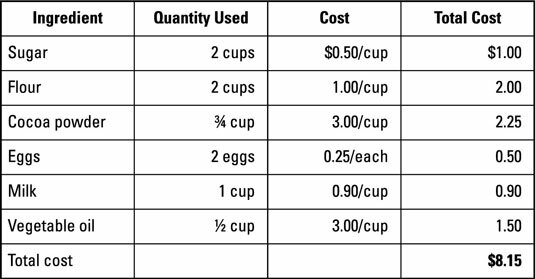 Eggs cost $0.25 each and milk costs $0.90 per cup. Vegetable oil costs $3 per cup. The figure shows you how to calculate the total cost of direct materials needed for one cake, adding together the cost of all the individual ingredients used to make it. Direct labor is the cost of paying employees to make your products. Companies carefully estimate how much direct labor goes into each product made — that is, how long each kind of worker takes to do the job. Then, to find the total direct labor cost of the product, they multiply this time period by the hourly cost of paying each worker. Just multiply the time needed to make the product by the cost of paying the worker. Say one worker takes two hours to make a product; if that worker earns $12 per hour, then the direct labor cost of the product equals $24. For example, suppose that brain surgery in a certain hospital requires two hours from a neurological surgeon (billing at $500 per hour) and four hours of nurse time (that is, two nurses working two hours each, costing $100 per hour). The following figure demonstrates how to estimate the cost of direct labor for this procedure. Direct labor represents just one component of the total cost of manufacturing goods. Other costs may also be necessary for this brain surgery procedure, such as direct materials (say, blood for a transfusion) and overhead (the cost of lighting and heating the operating room). Indirect materials: The cost of raw materials needed to make products that you can’t easily trace to the finished products. Such indirect materials are usually inexpensive, may be used in small quantities, or are difficult to measure. For example, if you bake cakes, you can easily trace the amount of flour or sugar that goes into each cake. However, measuring exactly how much cooking spray you use to grease each cake pan would be an absurd waste of your time. Therefore, you classify the cost of the cooking spray as an indirect cost. Indirect labor: The cost of labor that you need to make products but that you can’t easily trace to the finished products. For example, suppose your factory requires maintenance workers to mop the floors. You can’t really tie a specific amount of floor cleaning to every individual product you make, so you label the cleaning cost as indirect. Other costs needed for operations: The cost of items such as electricity, property and other taxes, insurance, and depreciation of factories and equipment. Think about overhead costs as “other costs.” That is, if a cost isn’t direct labor or direct materials, then it goes into overhead. As factories automate, they in essence replace human workers with machines. Therefore, as they implement new manufacturing technologies, factories rely less on direct labor and more on overhead. In a modern factory, direct labor can account for 5 percent or less of total manufacturing cost. A completely automated factory doesn’t need any direct labor at all.